Sage und schreibe acht Karten sind übers Wochenende bei mir entstanden, aber nur eine davon kann ich euch heute schon zeigen. Sie wirkt vielleicht nicht gerade spektakulär, zeigt aber, dass man mit etwas Inspiration und dem richtigen Zubehör auch auf die Schnelle ein süßes Kärtchen zustande bringen kann. No less than eight cards I've made over the weekend. Unfortunately, I can only show you one of them today. And I'm afraid this one dosen't even look quite spectacular. It does, however, show that with a little bit of inspiration and only a few accessories you can accomplish a cute card quickly. 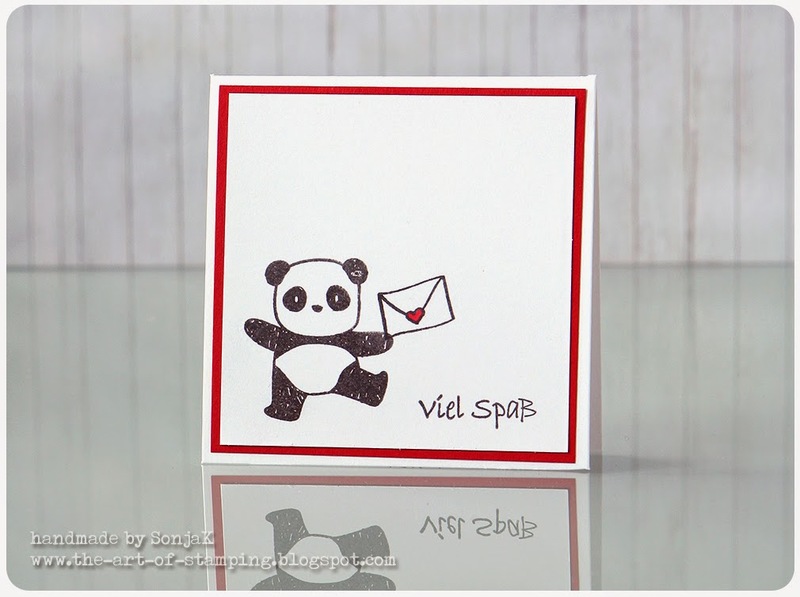 For this mini card I've used the Mama Elephant set "Pandamonium". Initially this set left me quite indifferent. Those little critters were cute, of course, but you can't really color them in and when stamping them you are quite limited colorwise too. However, shortly before Christmas the benefits of a set with which you can create nice little cards within minutes that can bring smiles to the recipients' faces suddenly became clear to me. So I just had do get it. After all, it worked with you too - the thing with the smile, didn't it? Super cute and I love the simplicity! Fabulous take on the photo inspiration. Thank you for sharing at ATSM. :) - es hat geklappt! 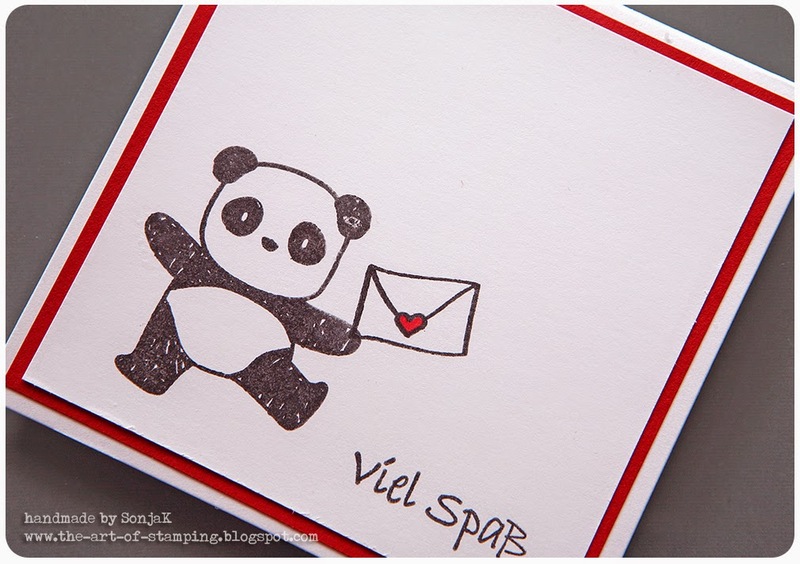 Your simple little panda card is truly adorable and sweet! Sometimes less IS more, as you've shown so wonderfully! Thank you for sharing this cutie in the ATSM gallery! Super CUTE card! Love your clean design! Thank you for sharing at ATSM. Deine Karte ist echt niedlich geworden. Ich mag total gern die Farbe Rot und der Panda ist echt niedlich. Super adorable card!! Love your CAS design!! This is so cute Sonja! I love its CAS design, and beautifully stamped images! Thanks for sharing!